Vincent D'Onofrio, Rodrigo Santoro, Diego Boneta et al. Adriano Aragon, Eric Bell Jr., Sven Holmberg et al. 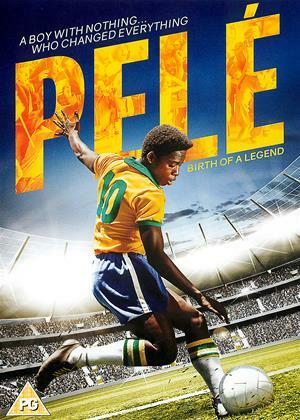 "Pelé" tells the miraculous story of the legendary soccer player's rise to glory from a young boy, to the 17 year old who scored the winning goal in Brazil's first ever World Cup victory in 1958. From a life full of disadvantages and an impoverished youth in Brazil, Pele used his unorthodox yet authentic style of play and his unbeatable spirit to overcome all odds, find greatness and inspire a country that he changed forever. Pelé: Birth of a Legend is a rags-to-riches story that happens to have the world’s most famous football player (the sport wherein you play with your feet) at its forefront. As you’ve guessed it, this player is none other than Pelé – whose life is a subject to countless documentaries and biopics during the course of sixty or so years aback. Only this time, the matter at hand is being taken care of by directors Michael and Jeff Zimbalist whilst also being penned by these two folk as well. In it, rather than portraying the prolific career of our titular character, the filmmakers decided to go for another approach that, ultimately, is nothing we hadn’t seen before. The film follows the likes of Pelé, a poor kid from Brazil whose only chance to show the world what he was capable of – was via the game of football. The film smartly cuts back and forth, superimposing Pelé’s concurrent life onto his childhood hardships and back; by choosing to tell this tale in such an order, the filmmakers deliberately emphasized the patriotic aspect of both the protagonist and his surroundings, which in itself transforms into something much more than just football. In fact, the narrative goes as far to suggest Edson Arantes do Nascimento as the spiritual leader of Brazil, something neither politicians nor other influential figures from the troubled country could achieve in their lifetimes. The young actor portraying young football prodigy Pelé (Leonardo Lima Carvalho) is himself a prodigy too, displaying his freestyle qualities (otherwise known as ‘ginga’) in full force. Perhaps he is a descendant of the great Pelé himself? It’s hard to tell, but the young bloke most certainly has the talent, the will, and the determination to succeed period. And his acting is on par too. Now, the tricky part. For some reason, Pelé: Birth of a Legend has Vincent D'Onofrio cast as Brazil's coach at the time Feola, and he does the job – poorly. His accent is off track and his mannerisms resemble those of an American-raised fellow, rather than a Brazilian who’s endured thick and thin in order to see his team run the green. The counterpoint to D'Onofrio’s strange accent comes in the form of Colm Meaney as Sweden’s coach George Raynor in perhaps the performance of his lifetime. As the two coaches clash, so do the teams yield challenge in wake of the infamous 1958 Football World Cup, and all bets are off. Audiences get to see Pelé as well, in a short cameo that would make any football fan appreciate the whole filmmaking effort. All things considered, whether you’re a fan of the game of football or not, Pelé: Birth of a Legend is an experience like none other which could’ve been better, but it just is. Worth a viewing in my book.